This task is a little difficult for me. Please check this essay if you have time. Thank you in advance. The graph below shows information on employment rates across 6 countries in 1995 and 2005. Summarise the information by choosing and describe the main idea, and make comparisons where appropriate. » Write at least 150 words. 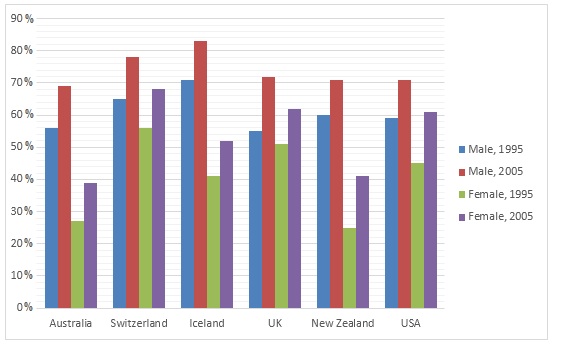 The supplied bar graph compares the employment rates between working men and women in 6 different countries including Australia, Switzerland, Iceland, UK, New Zealand and the USA for the years 1995 and 2005. It is clear that more men were employed than that of women in all of the given six nations. the second biggest point is that the employment conditions in Iceland, Switzerland were comparatively better than the other four countries. As is observed from the given data, the gap between male and female job holders ranged from approximately 10% to 18% over the six countries in the time mentioned. The greatest scale occurred in New Zealand and USA in the year 2005. Specifically, there was about 62 percent of men who had a job, but only 44 percent of women were employed in the USA whereas these figures were 42 percent and 24 percent respectively in New Zealand. On the contrary, Iceland was the place where showed the smallest difference in the percentage of male and female workers. It was 52 percent for men and this sector for women was nearly 42 percent. For male gender, among 6 countries above, it can be seen that labor market was by far the most abundant in Iceland with approximately 71 percent and 83 percent of men were hired in 1995 and 2005 respectively. For female gender, Switzerland was the place where satisfied the highest ratio demand for job seekers. According to the statistic, 55 percent and 68 percent of women could find their job in 1995 and 2005 respectively. Please rewrite your essay and post your revision. It will be good practice. You have excellent skills of observation, but you do not understand the terminology. The supplied (in natural English, past participles like "given, supplied" are post modifiers. It is better to avoid them. They are superfluous anyway.) bar graph compares the employment rates between working men and women (The employment rate of working men and women would always be 100%, because all working men and women, by definition, are employed. ) in 6 (Use words for small numbers that are categories, not data values.) different countries: including Australia, Switzerland, Iceland, UK, New Zealand and the USA for the years 1995 and 2005. It is clear that (Words like "clear", "obvious" "apparent" are opinion words. Avoid expressing any opinions in task 1. Leave that to task 2, which often asks you for an opinion.) First, more men were employed than that of women in all of the given six nations in both years. the second biggest point is that Second, the employment conditions in Iceland, Switzerland were comparatively better than the other four countries. Third, the employment rates were higher for both sexes in 2005 than in 1995. As is observed from the given data, (This is an expression that has no meaningful content. Of course you are looking at the data. Just tell the reader what you see, not the fact that you are looking at it.) The gap in employment rates between males and females job holders (You made the same error here as in the first paragraph. The employment rate of job holders, by definition, is always 100%. There is no difference between the sexes. ).ranged from approximately 10% to 18% over the six countries in the time mentioned. The greatest scale (wrong word - difference, ) occurred in New Zealand and USA in the year 2005. Specifically, there was about 62 percent of men who had a job, but only 44 percent of women were employed in the USA whereas they these figures were 42 percent and 24 percent respectively in New Zealand. On the contrary, Iceland was the place where showed the smallest difference in the percentage of male and female workers. It was 52 percent for men and this sector for women was nearly 42 percent for women. For males gender, among 6 countries above, employment rates were highest it can be seen that labor market was by far the most abundant in Iceland with approximately 71 percent and 83 percent of men were hired (wrong word. It is employment status, not the hiring rate. The chart does not show anything about job seekers, those looking for a job or hiring. ) in 1995 and 2005 respectively. For females gender, Switzerland was the place where satisfied the highest ratio demand for job seekers. (erroneous and unnatural description.) According to the statistic, 55 percent and 68 percent of women could find their job in (wrong description. 55 percent of the men did not find employment that year. Most of them would have been working in the same job as they had the previous year.) 1995 and 2005 respectively. Thank you for your help, I will rewrite my essay to be better after reading your corrections.